Leadership – a driving strength to equip and develop others and chart a course and navigate forward. We are transformation leaders, innovative and always seeking to helps others realize their fullest potentials! Be a good hearer - full communication is mindful of the spoken and written (and tone) as well as the unspoken or non-written (omitted), and non-verbal communication and engagement (or not). Do the right thing. Don't take the path of least resistance especially if it compromises excellence and safety! Ask questions that embrace yet articulates and engages others. Equip people to be successful. Demonstrate support and offer beneficial encouragement and affirmations. Do not patronize, appease, or offer flattery-people see through that quickly! As a leader be careful not to micro manage. If people are properly equipped they will be successful, and they will take care of your organization. Encourage and develop people. Allow people to belong as they become, but consider right-fit. Set performance expectations; set people up for success, not failure or setback-be realistic. Leadership requires strong people skills – it's the art of work for, with, and through people and their strengths and gifts. Be objective in your perspective. Identify problems or improvement opportunities and implement resolves that are measurable and sustainable. Understand the interplay between people, process and technology. Be consistent in practice...others do notice! Culture & Engagement – comprises listening, relationship, ideals of partnership, courage, accountability, freedom, team, and being objective in perspective. Our efforts work that brings about a change in culture that enhances the workplace whereby "passively engaged" and "disengaged" employees become more involved, more enthusiastic - more "actively engaged." How actively engaged are all members of a team? Our team, being very entrepreneurial, considers the level of intra-entrepreneurial-ship the organization's culture fosters. Do employees feel like a partner, respected for their contributions (knowledge, skills, giftedness…)? We look at team-does it express and live-out respect and dignity? What type of recognition programs exist? Is there appeasement given to the loudest and often squeaky wheel? Or worse, is recognition taken from those who actually do the good work by those who are in leadership? Do people (members of the team) really have a voice in matters that they are most expert at? Are people truly given full ownership without micromanagement? At the same time, is there a culture of equipping people to be successful? 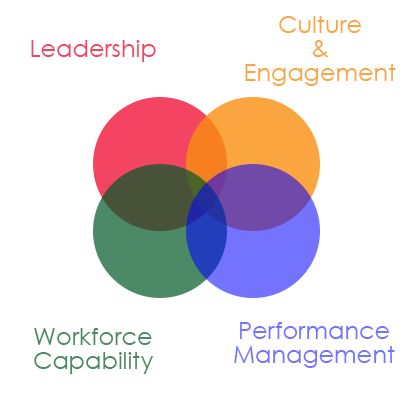 Workforce Capability - considers measurable productivity and involves many aspects of team and individual.